We wanted to experience this activity and see what this experience would be like compared to other popular beach destinations. I have personally done parasailing in Ixtapa, so I was really curious to have this comparison. 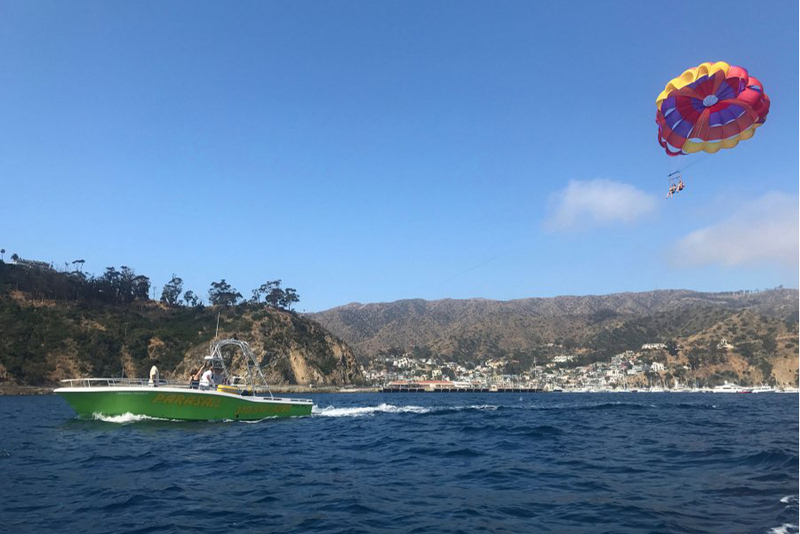 We booked our parasail ride with Island Water Charters over the phone, which was very easy. They were very accommodating over the phone and answered all of our questions. We arrived in Avalon for the day and headed to the Green Pleasure Pier, where they were located. After we checked in, we decided to add the photo package to our experience, because how many times in a lifetime are you really going to experience this? We wanted to remember it. There were three of us doing the 800 ft flight. We got our sunscreen and our safety vests on, and we were ready to get on the boat. We drove out just past the breaking point as the friendly crew explained what we need to do. One at a time the crew assisted us in securing the life vest and harnesses on. Once they launched the chute, we walked to the back deck of the boat and got clipped in. Three seconds later, we sailed away without ever touching the water. It was amazing! Such silence and peace in the sky as we just floated in the air. You had this time to yourself to think, appreciate the beauty of the water or even have a mini meeting. You never get that silence in real life as the wind hits your skin, and your mind travels away from everyday chaos. Once we came back down we just wanted to get back up in the sky. The experience was amazing and I would highly recommend it to anyone. It was a completely different experience from the one I had in Ixtapa. I felt safe for one, and seeing the Island from a birds-eye-view made me realize how close this paradise is to home. So why did I wait so long?